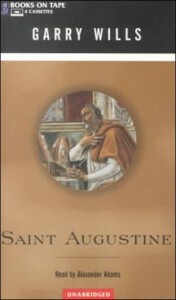 As with Karen Armstrong's Buddha (review: http://www.goodreads.com/book/show/2199695.Buddha), I can't do justice to Garry Wills' biography of Augustine of Hippo because I listened to it via audio cassette as I drove to and from work. I will say this, despite its brevity (less than 200 pages in print), Wills' manages to present a surprisingly complex and insightful portrait of the man and his thought. He actually managed to turn the saint into a sympathetic figure. I've never liked Augustine much as a person but the author's interpretation made me sympathize with the decisions Augustine made in his life (like sending his long-time concubine and mother of his son away). Highly recommended, print or audio (in fact, I should read the print version because I know I missed a lot just listening to it). Garry Wills is a brilliant writer and anything he authors is worth the effort to read.